292 pages | 85 B/W Illus. Hedges and field margins are important wildlife habitats and deliver a range of ecosystem services, and their value is increasingly recognised by ecologists. 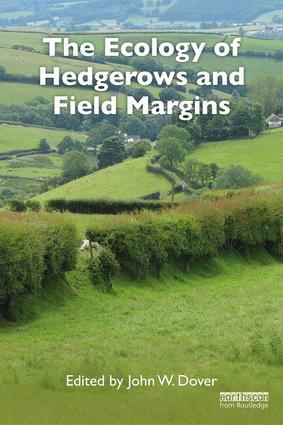 This book reviews and assesses the current state of research on hedgerows and associated field margins. With the intensification of agriculture in the second half of the last century, field sizes were increased by amalgamation and the rooting out of hedges, synthetic pesticide and inorganic fertiliser use increased, and traditional methods of hedge management were largely abandoned. The book is split into two main sections. The first deals with definitions, current and historic management, the impact of pesticides, the decline in hedge stock and condition, and new approaches to hedge evaluation using remote sensing techniques. The second section explores the pollination and biological pest control benefits provided by hedges and field margins and examines the ecology of some of the major groups that are found in hedgerows and field margins: butterflies and moths, carabid beetles, mammals, and birds. A case study on birds and invertebrates from a research farm managed as a commercial enterprise, but which attempts to farm with wildlife in mind, brings these themes together. A final chapter introduces the neglected area of hedges in the urban environment. The book will be of great interest to advanced students, researchers and professionals in ecology, agriculture, wildlife conservation, natural history, landscape, environmental and land management. John W. Dover is Emeritus Professor of Ecology at Staffordshire University, UK. He has a particular interest in the ecology of butterflies on farmed land, especially in relation to hedges, green lanes, and extensive grassland. He also has an interest in the urban environment and is the author of Green Infrastructure: Incorporating Plants and Enhancing Biodiversity in Buildings and Urban Environments (Routledge, 2015).